Homeostasis is a term translated from the words Homeo meaning ‘’same’’ and stasis meaning ‘‘standing still’’. This term simply describe a dynamic state of equilibrium and the ability of the body to maintain a stable internal condition with a changing outside environment. This process is used to maintain and regulate body temperature, blood sugar level, blood pressure, endocrine system, excretory system and by counteracting the effect of any abnormal level of these factors. Three main components are responsible for the equilibrium process. The receptor which receives information, control centre, receives input from the receptor and the effector, adjusts the factor to a desirable response. Bitesize; 2014. Homeostasis. [Online]. Available from:< http://www.bbc.co.uk/schools/gcsebitesize/science/add_aqa_pre_2011/homeo/homeostasis1.shtml> [Accessed 08 2015]. The normal temperature of the body is around 37°C. To keep the body at this temperature, the amount of heat generated by the body must balance the amount of heat loss. 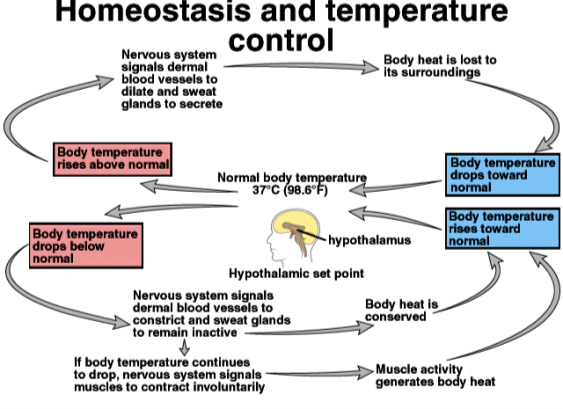 Body temperature is regulated the hypothalamus in the brain – also known as the processing centre. Any changes in the temperature get detected by the temperature receptors in the skin and blood around the effector (e.g. sweat gland and muscles) to bring the body temperature to normal. In hot conditions, temperature, the sweat gland produces sweat, this cools the body as it evaporates. The skin dilates (vasodilation) allowing blood to flow through the skin capillaries therefore increasing energy loss. The hair on the skin flattens. Also in cold condition, the body responds by causing muscles to constrict (causing shivering) the capillaries of the skin constrict (vasoconstriction) restricting the blood flow through the skin. The hair on the skin stands up to trap more warm hair. The mechanism is show in Figure 1 below. Endotherms (e.g. mammals and birds) can maintain constant body temperature because they have internal insulation that generates their own heat internally. An advantage of this is that they can survive over a wide range of environment and the disadvantage is that they require more food for energy. Ectotherms (all animals except endotherms) do not have thermal insulation to generate internal body heat; they rely on the environment for a heat source. An advantage is that they use less energy and a disadvantage is that they can only be active at certain times of the day (night). It is important that the homeostatic mechanism is kept at equilibrium as a failure may result to rise in body temperature above normal (hyperthermia) due to prolong exposure to high temperature or a decrease in the body temperature below normal (hypothermia) due to prolong exposure to low temperature leading to enzymes and cells not able to function at optimum condition, failure of organs and possible death of organism. Figure 1: Negative feedback regulation of temperature. Water makes up almost the entire volume of fluid in the body. Its regulation is crucial for survival. Apart from water, salt is a functional component of body fluid that is important to the overall body homeostasis. Water is gained from food, drink and respiration and it’s lost through sweating, excretion of urine and faeces. Therefore there is a requirement for our body to maintain balance between water intake and water loss. This is done by the actions of the kidney and highly sensitive cells in the hypothalamus (osmoreceptors). Water is homeostatically regulated through intercellular and extracellular means. Intercellular fluid regulation depends on the level of salt in the body and it works on the principle of osmosis. Any change in the level of salt in the fluid that surrounds cells (extracellular fluid) prompts an equal and opposed change in the salt level within the cell. i.e. movement of intracellular fluid across membrane- to compensate for the change. During exercise, a fall in the level of water in the blood gets detected by the processing centre (hypothalamus) which stimulates the pituitary glands to release antidiuretic hormone (ADH). ADH travels to the kidney through the blood to prompt the reabsorption of water from the kidney into the blood before it is excreted as urine, which is usually in concentrated form. On the other hand, when the level of water in the blood rises the hypothalamus detects this change consequently, sends a message to the pituitary gland to stop the release ADH into the blood thus preventing reabsorption of water from the kidney. This results to passing out of large volume of diluted urine. The process of maintaining water level follows a negative feedback system where by as the level of blood water drops, the system ensures that ADH is released and vice versa. The importance of this process is the prevention of oedema or possible circulation system shutdown as a result of unregulated excessive blood water level. The human body requires that the level of blood glucose be maintained and kept constant, the endocrine system such as the pancreas produce and release hormone into the blood stream which homostatically maintain internal environment of the body. In the presence of insulin the level of glucose in the blood normally range from 80-120mg/100ml of blood and can rise up to 600mg/100ml of blood (Marieb, 2012). The pancreas is responsible for the secretion of insulin and glucagon for the regulation of blood sugar level. It is located in the abdominal cavity. The islets of langahans are cells of the pancreas that are responsible for producing hormones that maintain blood sugar levels. They are the alpha (α), beta (β) cells and delta (δ) cells. The alpha cells secrets glucagon which raises the blood glucose level in the blood, the beta cells secrets insulin which lowers the blood glucose level, the delta cells secrets somatostatin which regulates the alpha and the beta cells. After a meal, the level of blood glucose increases. This stimulates the pancreas thus triggering the β- cell of the islet to release insulin into the bloodstream. This action enables glucose to be absorbed by the body cell (target cells). This is further oxidized froe Adensine-Triphosphate (ATP) energy production (Glycolysis). Excess glucose is stored in the liver where glucose is converted to glycogen (Glycogenesis) or fat. This consequently reduces the level of glucose in the blood as a result of the increased consumption of glucose by the cells for energy. It is important for this level to be brought from high to normal in order to prevent a medical condition called hyperglycaemia. After several hours of eating a meal or being in an activity, the glucose level in the blood falls. This stimulates the pancreas thus triggering the α- cells of the islet to release glucagon into the liver. The glucagon acts as an antagonist to insulin; it helps to regulate blood glucose level but in a way opposite that of insulin. (Marieb, 2012). The glucagon stimulates the breakdown of the stored glycogen to glucose (Glycogenolysis) which is then released into the bloodstream to compensate for the fall in blood glucose level. This process of blood glucose regulation works under the control of the negative feedback mechanism by lowering a deviation from normal value. For example, low blood glucose result to the production of glycogen also a rise in blood glucose shuts down the stimulation of glucagon production. The central nervous system comprises the brain and the spinal cord. The brain is divided into the forebrain, (cerebrum), mid-brain (hypothalamus) and the hind-brain (cerebellum). Its primary function is to receive impulse from the sensory organ and co-ordination of different body activities. The spinal cord extends from the brain to the tail of the vertebra column conveying nervous impulse. Its function is to transfer transmit impulse to the brain and t act as a reflex centre. 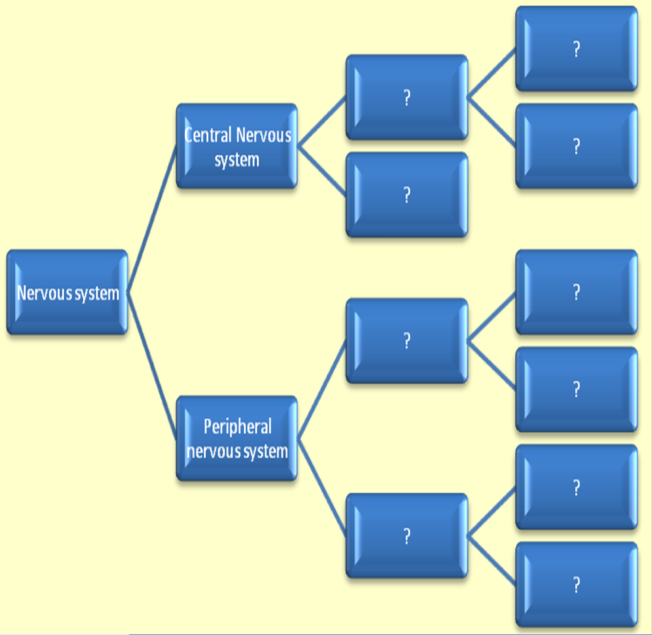 The peripheral nervous system consists of the somatic nervous system and the autonomic nervous system. The somatic nervous system is responsible for voluntary activities and response to stimuli. It consists of the sensory and motor nervous system. The sensory nervous system transmits impulse to the brain using dendrites (fibre) while the motor nerve transmits impulse from the brain via the spinal cord to the effector organ (muscle and gland) using axons (fibre). The Autonomic Nervous System (ANS) regulates the body involuntary activities. It causes changes in size of the pupil, heartbeat and secretion of glands. It consists of sympathetic and parasympathetic. Sympathetic action which prepares the body to face danger or stress by speeding up heartbeat and dilation of the pupil and the parasympathetic action which is prominent during rest e.g. reduced metabolic rate, reduced pupil size. Dangond, F; 2014. Anatomy of the Central Nervous System [Online]. Available from:< http://www.emedicinehealth.com/anatomy_of_the_central_nervous_system/article_em.htm> [Accessed 15 June 2015]. The endocrine and nervous system do share certain similarities with some existing differences in their control mechanisms. The similarities between the two systems include, playing part in the maintenance of the internal environment of the body (Homeostasis), as well as providing the body with a means to communicate with the internal and external environment for response co-ordination. For example, both systems use chemicals to transmit messages (chemical neurotransmitters and chemical messengers). Also for both systems the release of chemical are due to stimulation. However, the main differences between the two systems are as follows; in endocrine system, the route of transmission is via the blood stream to the target organ. Its effect is widespread as a single hormone may act on many organs far away from each other. It produces a slow response to stimuli because the hormone reaches its destination in the speed at which blood flow through the vessels. Its secretive action goes for a long duration example of which are found in growth and development. In the other hand, in nervous system, the route of transmission is through neurones along nerve fibres, its effect is localized and it response to stimuli is usually rapid usually in milliseconds and in short term as noticed in the contraction of muscle in a reflect action. Robert, M; Reiss, J, M & Monger, G; 2000. Advanced Biology. [Online] Available from: <https://books.google.co.uk/books?id=HHaDGynAz1EC&pg=PA372&lpg=PA372&dq=differences+between+endocrine+and+nervous+system&source=bl&ots=v7XDidGXqx&sig=KERUvCjwEo52dQuTPRf2LdXkNJ0&hl=en&sa=X&ved=0CDcQ6AEwBDgUahUKEwjGnOi4oZLGAhXDWBQKHcdUAI4#v=onepage&q=differences%20between%20endocrine%20and%20nervous%20system&f=false > [Accessed 14 June 2015]. Rushton, L; 2009. The Human Body How it works; the Endocrine System. [online]. Available from; < https://books.google.co.uk/books?id=YKU0xJyc-PIC&pg=PA14&lpg=PA14&dq=differences+between+endocrine+and+nervous+system&source=bl&ots=gNWyVOzFwn&sig=uLUsyaW09474z0NfiRIpOa9xvhE&hl=en&sa=X&ved=0CDwQ6AEwBTgUahUKEwjGnOi4oZLGAhXDWBQKHcdUAI4#v=onepage&q=differences%20between%20endocrine%20and%20nervous%20system&f=false> [Accessed 10 June 2015]. The removal of waste is part of an organism’s life. The excretory system is the system in the body that is responsible for carrying out this action. It performs function such as maintenance of fluid volume, osmotic concentration of extracellular fluid and excretion of toxic by-product such as urea, ammonia, and uric acid. The organs of the excretory system include the liver, lungs, skin and the urinary system which includes the kidneys, ureter, bladder and urethra. The liver is situated on the right side of the upper part of the abdomen, beneath the diaphragm. It is the known as chemical factory of the body because of the reactions that takes place within it. 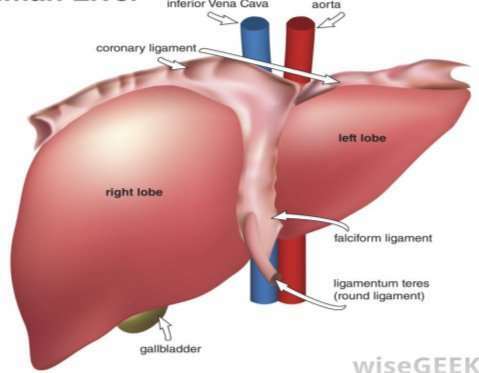 Some functions of the liver include the metabolism and storage of carbohydrate and lipids, the ingestion and destruction of foreign matter and worn out blood cell. A gall-bladder embedded in the right lobe stores bile emulsifies fats into useable fat and acidic waste into harmless substance. The lungs help to maintain blood-gas homeostasis by eliminating CO2 produced by the body while the skin helps excrete water and salt as well as small amount of urea and lactic acid. Blood carrying urea is later transported from the liver to the kidney by the renal artery. The kidneys are reddish brown bean-shaped organs, located between the rib-cage on either side of the vertebral column. The functions of kidneys include; excretion of urea, elimination of toxins and drugs, regulating the amount of hydrogen ions in the blood, maintenance of blood pressure etc. 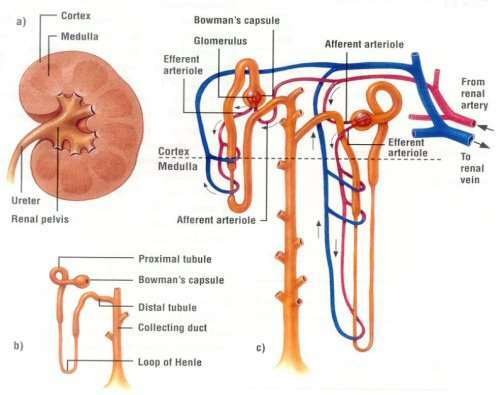 Other specialised units (Figure 3(C)) which enhance its excretory functionalities enable Blood containing urea to passes through the cup-shaped Bowman’s capsule containing the glomerulus where filtration occurs. The filtered fluid containing, water, glucose and salt are re-absorbed in the tubules. The remaining fluid containing urea, water and salt passes through the collecting ducts into the bladder through the ureter where it is stored for excretion. See below, the structures showing the main component of the excretory system. CliffsNote; 2014. Human Excretory System. [Online]. Available from: <http://www.cliffsnotes.com/sciences/biology/biology/excretion-and-homeostasis/human-excretory-system> [Accessed 10 June 2015].